On 3 May in Miami, Florida, IITA banana breeder Rony Swennen was honored with a prestigious award by the Association for Cooperation in Research and Integral Development of Banana and Plantains (ACORBAT). 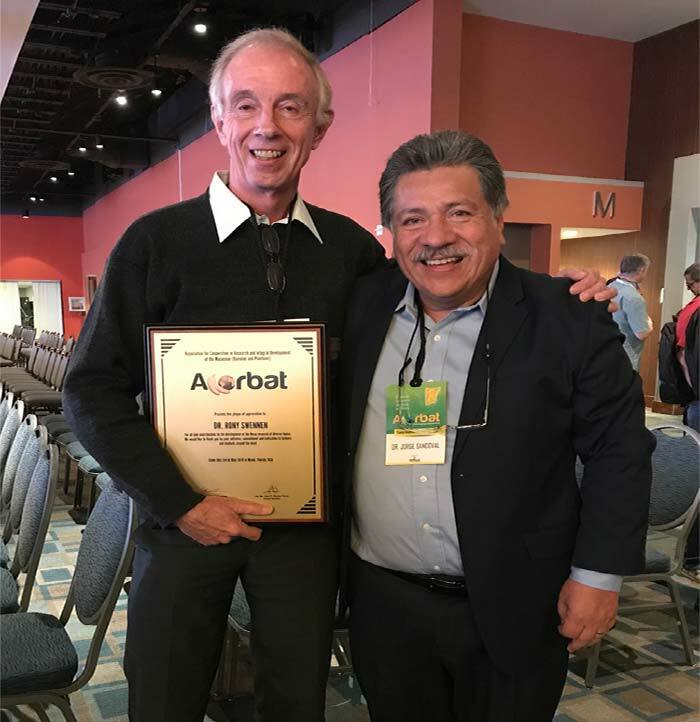 Rony Swennen (left) and the President of ACORBAT, Jorge Sandoval (right). He highlighted the need for growing improved banana varieties both for economic enhancement and global relevance which would promote all efforts that had been put in place by Musa researchers and students all over the world. In the past 31 years, IITA, in collaboration with 14 partners all over the world, has been working to improve the banana breeding platform. The breeding pipeline aims to increase breeding efficiency, involving flower biology to increase seed set, improved management with a tracking system, heterosis studies, and combining phenotypic with genetic data to select crosses. It also involves searching molecular markers for biotic stresses and developing genomic prediction tools to hasten selection of hybrids of interest. Congratulations. More awards to come.